ECO & BIO ROOTS brings to you this superior quality aloe vera face pack with its natural extracts in a packaging of 50gms to provide fine quality products for beauty and wellness. 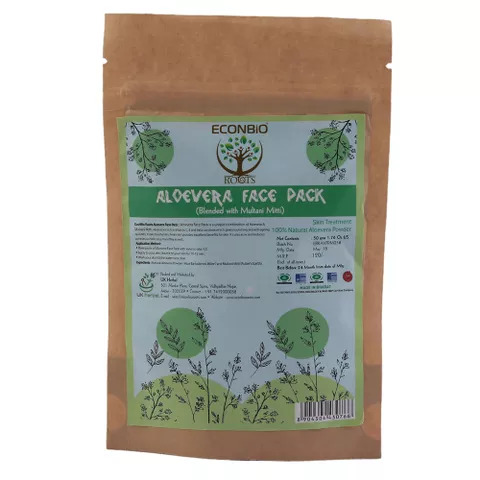 Aloe vera face pack has antimicrobial properties which make it ideal for skin suffering from outburst of acne and pimples. It naturally reduces dullness of the skin and gives it a natural glow while thoroughly hydrating the skin and leaving it moisturized naturally. Make paste of Aloe Vera Face Pack powder Apply to your skin, leave it on your skin for 10-15 min. Wash your skin till the water runs clear.